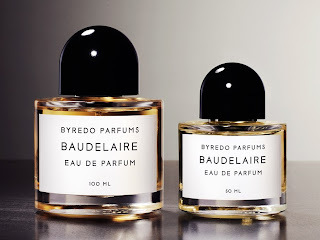 Baudelaire may be a niche scent, but if you look at the list of notes in it, it doesn't look like anything special: juniper, pepper, cardamom, patchouli, leather, incense, amber, etc.. No fancy-pants "East Moroccan Wood" or other such nonsense. It looks like the pyramid for an 80's powerscent. However, Baudelaire shows what amazing things can be done when such plain ingredients are put in the hands of a talented perfumer. I believe Baudelaire is marketed to men, and if not, it should be. A daring woman could pull this off, but this scent really radiates masculinity. I don't know whether to call this an oriental, a leather, a wood fragrance or a patchouli. It smells like all of them at once, which is what's so fascinating about it. Like Muscs Koublai Khan, this is another brown and black kaleidoscope of scent, as the leather, patchouli and incense whirl around you all day in a warm, animalic cloud. Sometimes you feel like you're wearing patchouli, while other times you get a buttery tan leather smell, and other times the two come together and create a sort of dirty smell like that of bodily fluids or hair oils. Earlier today, after I'd been wearing this for about seven hours, my wife came up to me, sniffed my neck, and told me I smelled like cedar. She said I smelled wonderful. This is a warm, rich scent, but it's not sweet, and I appreciate that. Rather than having a base of syrupy vanilla or benzoin, Baudelaire rests on a cushion of animalic leather, as well as black amber, whatever that is. I guess black amber is amber that's not too sweet. Whatever it is, it works perfectly. Nothing in this fragrance smells synthetic - this is pure luxury. I've never smelled a fragrance quite like this. At $145 for a 50 ml. bottle, you'd better get a lot of mileage out of this juice, and Baudelaire delivers the goods big time. I put this on 11 hours ago, and I can still smell it on myself, still going strong. What's more, I love the way it projects. Like Azzaro Pour Homme and Giorgio For Men, Baudelaire is another "aura" fragrance, meaning that it smells best when you're not sniffing your skin up close. All of the facets I've described above are what I smell on myself at a distance. When I sniff my wrist up close, I hardly smell a thing. Paying 145 smackers for a bottle of perfume is tough to swallow, and I don't do it very often, but this one was worth it. Baudelaire delivers both the high quality and uniqueness I expect from a niche fragrance in this high price bracket.